Holboellia latifolia WJC13811 etc We were puzzled to see so much of this vigorous woody-stemmed evergreen, twining climber on one of the trails in the autumn of 2013. 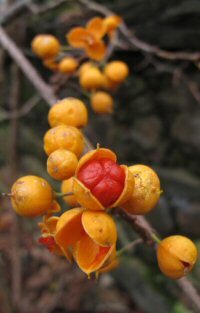 It soon became apparent that the fruit was popular with the locals walking up and down the trail happily munching their way through the fruit and spitting the seed out into the hedgerows (where it germinated). Forming vines to 6m, with leaves composed of five or more, leathery dark green glossy leaflets. 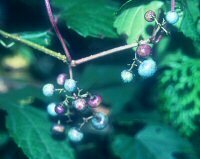 Bearing in spring an abundance of separate male (flared buttermilk-yellow) & female (plump, bronzy), highly scented flowers followed by white-purple sausage-shaped edible fruit. Holboellia latifolia var. angustifolia WJC13784 A seed collection from our second encounter with this possible new species, which the current world authority dissagrees with our current naming. 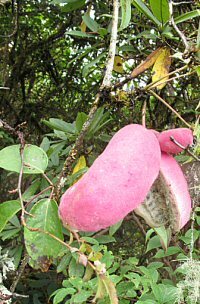 Found growing on our 2013 expedition at 2,200m, where this collection was scrambling over a large shrub, luckily bearing long slender purplish fruit. It will have male flowers a bronzy pink in colour on their exterior, greenish yellow interior, with the tips of the sepals recurving. The larger female flowers similar bronzy pink colour, both in and out, recurving at the tips. Lardizabala funaria This is the genus that lends its name to the entire family of wonderfully ornamental scented climbers which bear edible sausage-shaped fruit as well as the couple of shrubs also renowned for their colourful fruit. An evergreen woody-stemmed twinning climber with normally thick textured biternate leaves (hence its old name of ternata). Bearing dark purple male flowers in pendant racemes with larger female flowers of a similar colour held singly, resulting in normally three sausage-shaped lumpy fruit connected at their base. This will require a bit more care and heat than the previous. Heat is exactly what Ampelopsis aconitifolia BSWJ12982 enjoys, one of several seed collections gathered in Lucca BG while attending the annual flower show that we are invited to every September. Where this small tendril climber from the grape family grows happily on a west facing wall. Here it is kept to just 2m tall, clothed in its distinct deeply lobed and incised palmate foliage, dark green all summer transforming to a contrasting autumnal yellow by October. A perfect foil to the turquoise fruit that mature through the summer months. Ampelopsis glandulosa var. hancei BSWJ1793 on the other hand hails from one of our collections gathered in the mountain forests in the north of Taiwan. There it makes a strong growing deciduous vine, with autumnal tints. Best in full sun with some shelter, to ripen its blue fruit, any good soil. Ideal for forming a luxuriant cover for an unwanted carbuncle. It would appear that we have the last existing plant of Vitis × pulchra left in cultivation, which seems difficult to believe. It has the same qualities as both parents as seen in many a magazine image of our walled garden. One of the best autumn colouring climbers we grow. Which is believed to be a hybrid between V. amurensis and V. coignetiae, it is also believed to have been lost to cultivation only surviving in our mother plant. Forming a relatively small, but vigorous deciduous woody stemmed tendril climber to 5m. 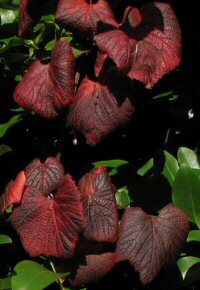 With leaves to 20cm across that are brightly coloured in spring and fiery red in autumn. Celastrus aff. stylosus WJC13746 Finlay could not keep his hands off it once he could see the ornamental merits of its fruiting display.A strong growing semi-evergreen twining species with rather large leathery leaves 15-20cm long. That we collected the fruit of in the deep valley at 2300m in the autumn of 2013. Bearing axillary or terminal inflorescences of small yellow flowers March to June in the wild, followed by their distinct yellow fruit autumn into early winter, splitting to reveal the red aril covered seed in upright spikes on this collection. green leaves highlighted with conspicuous silver veining. 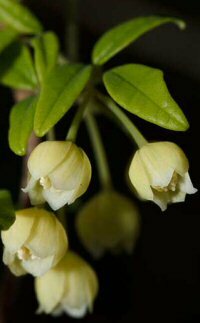 As well as small 3cm long yellow flowers produced along its stems through the summer with flared brown lips that are yellow veined and fringed with yellow 'hairs'. Retreating to a resting tuberous root during the winter. 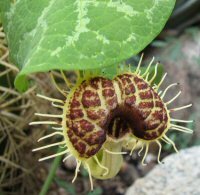 Too many favourites in this genus Aristolochia californica BSWJ13511 being just one of them, along with fond memories of our time with Sean Hogan in Oregon during the summer of 2013 and autumn 2014. Near Portland is where we collected the seed of this vigorous, yet suitably restrained twining climber to 3.5m, with heart shaped fealty leaves to about 10cm long. The foliage only appearing during the latter period of the flowering, in the form of tubby saxophones with large flared tawny-pink lips. Best sited to allow sunlight to backlight the plants in spring when the bare stems are crowded with translucent flowers, according to Dan Hinkley.